Here at Hinge, we set out to answer these questions in a recent study of 500 CEOs and marketing executives from professional services firms across the globe. The survey was simple: rate each of 15 online marketing techniques on a scale from 0 – 10 on how effective they are in generating leads for your firm. 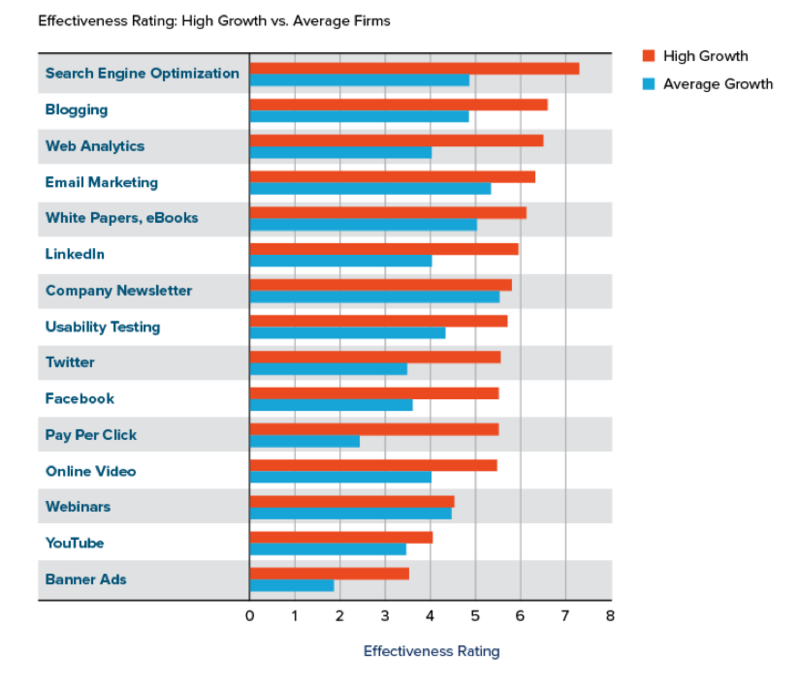 For high growth firms, the online marketing techniques rated highest in terms of effectiveness were search engine optimization (SEO), blogging, and web analytics. This was in contrast to the average growth firms, which rated company newsletter and email marketing highest. What might this mean for your firm? According to the study, high growth professional services firms seem to have a better understanding of how to leverage web content to produce leads. First and foremost, a solid SEO foundation is an important initial step to being found in search engines like Google. Taking the time to understand your most important keywords and writing optimized content around those keywords is critical if you want to show up in search results. But high growth firms don’t stop after a basic SEO campaign. The firms with the most successful lead generation strategies are the ones that continually produce highly valuable educational content via an online library or a blog. Publishing keyword rich blog posts on an ongoing basis attracts more links from other websites, increases the number of your web pages that are indexed in search engines, and also positions the firm as a thought leader. 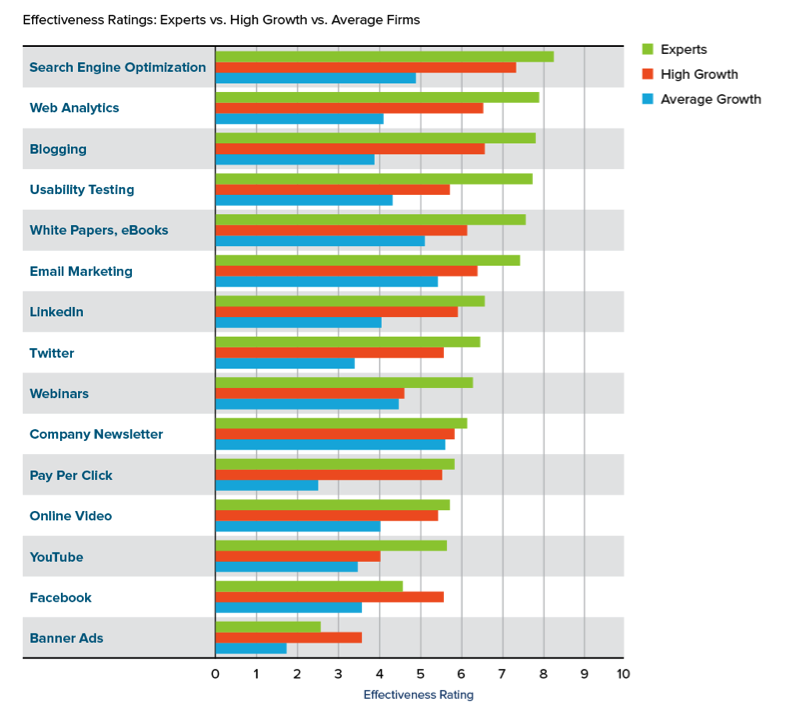 The experts’ ratings align fairly closely with the high growth companies’ ratings. SEO, web analytics, and blogging are all at the top of the list, being seen as highly effective techniques for lead generation. Social media techniques, such as LinkedIn, Twitter, Facebook, and Twitter, fall closer to the bottom of the list. Do the findings suggest you should abandon your tweets or forgo your LinkedIn posts? Absolutely not. Each of the online marketing techniques identified in the charts are useful for lead generation at different times. What’s important is to determine which marketing channels to tackle first. Before jumping into social media campaigns for example, consider first building up a library of quality, SEO optimized content. This will give your marketing team the ammunition it needs to be active and informative in social groups. Owning a library of content also makes email marketing much easier. If your firm’s emails are educational in nature and point to helpful resources, they will be more successful in nurturing prospects and building relationships. Listen to both the high growth firms and the experts. If you want to generate leads then put your focus on SEO and blogging first. The rest will then become much easier. Looking to learn more about online marketing techniques? Download the free ebook that covers this research study in detail, Online Marketing for Professional Services.